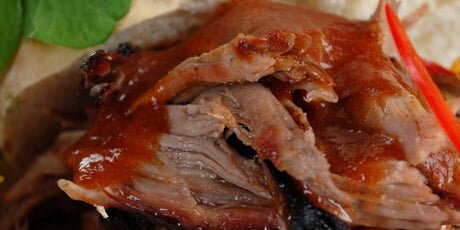 This pulled pork is the best I've ever had. Add BBQ sauce after the cook for pulled pork sandwiches, or use as is for burritos, carnitas, enchiladas, etc. Check out my other recipes for Homemade Refried Beans and Spanish Rice for a totally kickin' burrito! Place bay leaves in large pot, top with pork then sprinkle the spices evenly over the meat. Carefully so the spices stay in place, pour the broth into the pan (around the edges, in between chunks of meat). Cover, cook on lowest heat for 8 hours. After 4 hours, turn (ignore otherwise). Remove meat from juice and use 2 forks to pull/shred the meat. Juice can be added back in, a little at a time, if the meat needs some moisture. No follow? How should my fall garden grow?